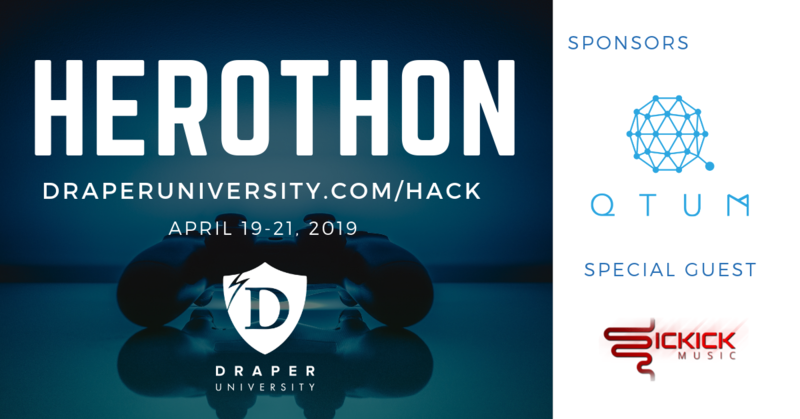 Draper University is happy to announce its first public hackathon, the HEROthon, sponsored by QTUM with special guest Sickick. The challenge is to build an application on QTUM that inspires the future of gaming and entertainment. While we want you to build something that is tailored to the above sentence, participants are free to build whatever they want. The judging and prizes will be based off of the challenge listed. What ticket should I get? All tickets are free because we want anyone interested to come. Choose what type of person you are based on the tickets listed. If you aren't any one of them, please choose the most relevant one. This just gives us an idea on who we can expect to come. What level of experience do I need to attend? Absolutely none! Although it's nice if you have some prior experience we do not require any experience to attend the hackathon. We want everyone and anyone interested to attend. Bring your friends as well! Do I need a team to attend? No, you do not need a team and don't need to know anyone! We will have plenty of time to meet people and form teams before the hackathon officially begins. By getting involved you will be joining hackers, product developers, marketers, business leaders and Draper University entrepreneurs in reshaping the future of decentralized gaming and entertainment. The HEROthon is held simultaneously with Draper University's Spring Pre-Accelerator program. Join a Draper University entrepreneur in hacking and pitching within 40 hours. You must build on the QTUM blockchain. Teams will have a chance to pitch to Draper U Ventures, Draper Associates, and the QTUM team. Winning teams get prizes and will be published on Draper University and QTUM social channels. Must be over 18 to participate. QTUM is defining the blockchain economy. Qtum is an open sourced public blockchain platform, leveraging the security of UTXO while enabling multiple virtual machines including EVM and the revolutionary x86 VM. Qtum is PoS based and boasts a Decentralized Governance Protocol (DGP) allowing specific blockchain settings to be modified by making use of smart contracts. For instance, the block size of Qtum can be increased without the need of a hard fork. With over 1.5 million followers, Sickick is quickly building his name and presence in the industry. His blend of musical genres creates an atmospheric, otherworldly auditory experience that so many fans have come to adore. Everyone has a dark side, find the beauty in yours. Recommended that everyone new to QTUM goes to(qtum.org/en/developer) reads the whitepaper, goes through the source code, and goes through the Developer's guide. 9PM | HEROthon Hacking Begins!